The Galion 433U smooth side body is especially designed for heavy-duty hauling requirements. It is well-suited for construction work, aggregate hauling and bucket loading. All units are built of tough high tensile steel to virtually outlast and outperform all others. 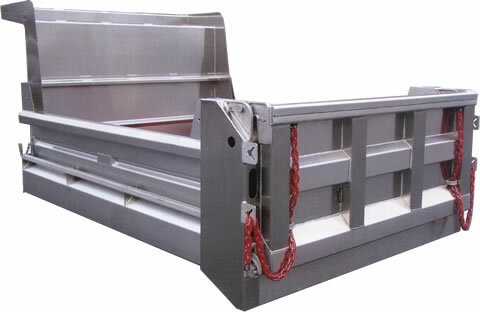 Recommended for single axle underbody hoist applications. Available in 9' and 10' lengths, 86" inside width, 26" sides, 32" or 36" ends. 10 gauge 304#4 stainless steel with material shedding boxed top rails, sloping bottom rails, 15" wide full depth rear corner post, 1 intermediate, formed in place horizontal "V" brace, 10" front and rear board extension pockets and full length tarp rails. Grip strut walkrail on both sides. 3/16" 400 BHN steel with 9" weld in radius. 10 gauge 304#4 stainless steel construction with two bend top flange and one formed in place intermediate "V" brace. 10 gauge 304#4 stainless steel, 3 panel design with full perimeter box bracing, two intermediate vertical braces and one intermediate horizontal brace, double acting design with long chains and two sets of banjo eyes and full width lower tailgate pin. Heavy-duty cast stainless steel "tarp-friendly" top hardware and stainless lower hardware with stainless manual release handle. Meets all requirements of FMVSS108 with oval stop/tail/turn lights recessed in rear post. All lighting is recessed, shock mounted, complete with factory wiring harness. Crossmemberless design using 3/16" X 100K formed 10" trapezoidal longbeams. Lubricated front and rear cross shafts and full width rear bolster. All Galion 433U Smooth Side bodies are shipped with a "body up" warning light and OSHA required back up alarm.